Recent discussions about how historians write have emphasized once again that writing is not an inspired activity. Waiting for your muse merely disguises indolence. As with any craft, writing improves with daily practice. Whether 3,500 words or 500 words or a page, stop making excuses and instead make time to write every day. Contrary to common assumptions, creativity increases with quantity. Research indicates that making writing a daily routine actually increases creativity. Carve out a few minutes every day to write inchoate ideas, sentences, and paragraphs. Write a lot. Revise what you write. Rinse and repeat. As the academic year approaches and promises to fragment the day, it is useful to recall that writing requires very little time. I am once again thinking about the value of persistence. My students had to hand in papers today. Although I encouraged them to hand in drafts—I’ve never had much success in requiring drafts—and tried to scare them into taking me up on my offer, a minority gave me a draft. As a result, I fielded a number of panicked conversations yesterday. In most cases, students doggedly maintained that they do their best work under a deadline or when inspired. While I was gently chastising them, I was thinking of my colleagues and all too often myself. 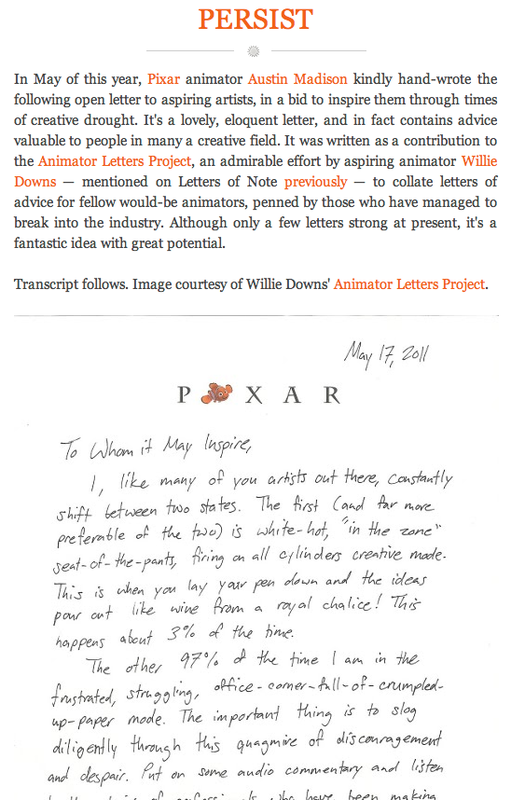 The trope of inspiration or creativity seems incredibly powerful, almost paralyzing. Inspiration and creativity don’t materialize out of thin air. They don’t arrive just in time to help finish that project whose deadline is looming (or has just passed). They don’t have any agency at all. Creativity and inspiration are not the motive forces behind something but the product of persistence and diligence. This is true in all creative activities—writing, drawing, painting, building, etc. Austin Madison’s letter on persistence. A few examples help make this point. 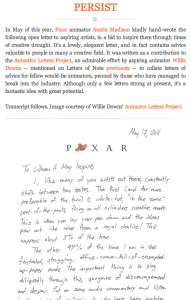 First, the letter at left was written by a Pixar animator Austin Madison (Thanks to Notorious Ph.D. and her post “Persist”for drawing my attention to this letter). He makes the point that most of your creative life and energy is spent in the “frustrated, struggling, office-corner-full-of-crumpled-up-paper mode.” That is to say, producing anything is often an exercise in combatting despair. The more often you win that battle the more creative you are. Every semester I find myself struggling to instill in students habits that generate creative thought and inquiry. That struggle motivated my efforts to structure the research papers in my courses the last couple years. See, for example, How to Teach Curiosity in the History of Science and Modeling Curiosity in the History of Science and Formulating Questions in the History of Science and Explaining Good Questions in the History of Science or previous posts here on last semester’s mapping project. But I don’t want to lose sight of the fact that persistence applies equally to me and my colleagues. Students often reflect what they see their mentors doing. If we wait for inspiration or claim to work best under deadlines, we shouldn’t be surprised if students do the same. 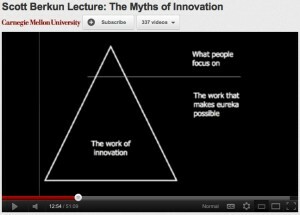 Scott Berkun gave a lecture a few years ago at Carnegie Mellon University on the subject of innovation: Myths of Innovation (it seems he might have given this lecture a few times after he had written a book by the same title). He opens by recounting a few iconic moments of innovation. Predictably, he invokes scenes of Newton under the apple tree and Archimedes running naked through Syracuse shouting “eureka” and then rightly dismisses them as myths of innovation. These events were not moments of innovation but rather are epiphany stories we tell ourselves. These stories mask the real work goes into any development. He dips liberally into history and the history of science to defend his argument that innovation occurs slowly and only through considerable time, effort, and failure. 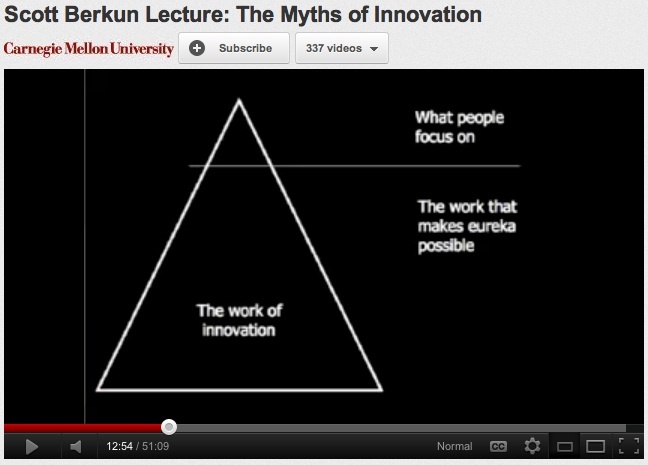 Berkun’s model for the relationship between work and innovation. One of his more useful points, useful for academics and students, pertains to the habits of “creative people.” Creative people work really hard and regularly and frequently. They make lots of mistakes. Creative people are not particularly attached to any iteration of their work and are willing to jettison a project along the way. Berkun’s claim is not new or innovative, but it is a useful reminder. A dominate idea among students and, I suspect, among academics holds that writing occurs in epiphanic saltations. We assume that if you sit long enough and think your thoughts will spring forth from your head in a brilliant, fully formed essay, like some academic Athena. Closely related to this is the myth that we do our best work when writing for a deadline. These are powerful and seductive myths. I see my students laboring under them every day. I have suffered from it. In the end, writing is like innovation. It is the product of hard work, daily. It requires a certain equanimity and detachment with respect to what you write. Good writing only happens at the end of a long process of revision, failure, and misdirection. You don’t write an essay so much as rewrite and revise and rewrite and discard and rewrite [repeat] an essay. Now if I could just convince students of this fact.